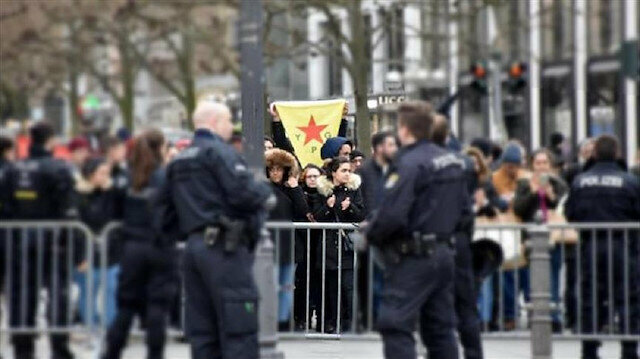 PKK/YPG representatives visited Paris on Friday to stress on the danger Daesh posed to Europe. The two co-chairs of Syrian Democratic Forces, affiliated with PKK/YPG, Riad Darar and Ilham Ahmad held talks in Paris with French officials over the U.S. withdrawal from Syria. They failed to meet French President Emmanuel Macron as they were not given an appointment, but met his advisors. “We conveyed our concerns over the consequences of the U.S. withdrawal from Syria to the fight again Daesh,” Ahmad told French daily Le Monde newspaper. Ahmad added that they know after the U.S. pullout, France will do the same and asked Paris' support against Turkey’s possible operation in the region. "We can’t control our prisons. We keep hundreds of Daesh terrorist there. We all have to fear if they escape from prisons. Our allies should understand that, if we have to lose our lands because of their pullout we can’t take those prisoners with us,” he said. “French officials told us, they will make efforts democratically but there is nothing concrete yet,” Ahmad added. French officials on Thursday said that their troops will remain in Syria after U.S. President Donald Trump announced the pullout of U.S. troops from the war-torn country. The U.S. began its air campaign in Syria in 2014, deploying troops to the country to assist in the anti-Daesh fight alongside local partners the year after. Trump's announcement came as a shock to many after several top administration officials, including National Security Advisor John Bolton, insisted the U.S. would not be removing its forces until Iran exited Syria. The withdrawal comes on the eve of a possible Turkish counter-terrorism operation against the YPG/PKK in northeastern Syria. Since 2016 Ankara has carried out two similar counter-terrorism operations in northern Syria.